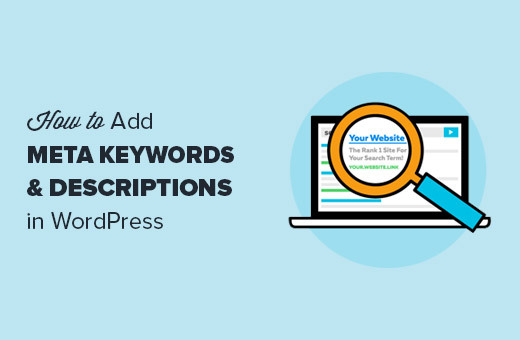 Do you want to properly add keywords and meta descriptions in WordPress? Meta keywords and meta descriptions allow you to improve your website’s SEO. In this article, we will show you how to properly add meta keywords and meta descriptions in WordPress. Why Add Keywords and Meta Descriptions in WordPress? Keywords and descriptions allow you to tell search engines more about the content of your posts and pages. Keywords are important words or phrases that people are likely to search for if they were looking for the content you are publishing. Meta description is a brief description of what your page or post is about. Meta keywords and description are actually HTML meta tags, and they go into your website’s header. 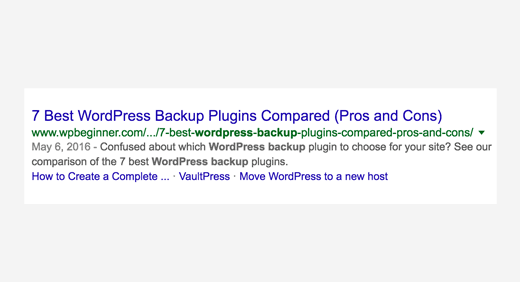 WordPress SEO plugins make it super easy for you to add them from your WordPress admin area for each post and page on your website. 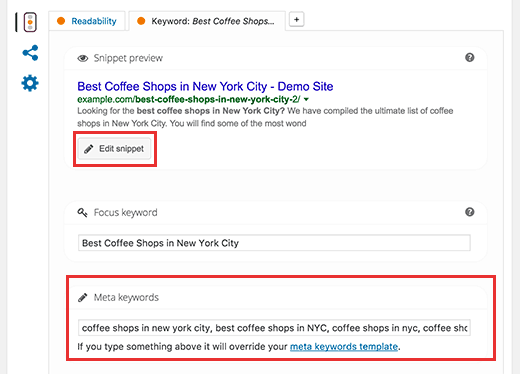 How important are meta keywords and descriptions for SEO? Search engines don’t exactly share how much weight they assign to keywords or description. However, it is quite obvious that they are important and help you rank better. Some SEO experts believe that keywords are not at all important. Even Google says that they don’t give importance to meta keywords. However, other SEO experts disagree and advise users to keep adding meta keywords. On the other hand, meta description is extremely important because you can use it to grab user’s attention. Having said that, let’s take a look at how to easily add keywords and meta description in WordPress. Note: For the sake of this tutorial we will be using Yoast SEO plugin. For more details, see our step by step guide on how to install and setup Yoast SEO plugin for WordPress. Yoast SEO comes with built-in support for description and meta keywords. However, the meta keywords feature is turned off by default. First you will need to enable it in order to use meta keywords on your WordPress site. You will start by visiting SEO » Dashboard page and then click on the ‘Features’ tab. Now you need to click on ‘Enabled’ under ‘Advanced settings pages’ option and then click on save changes button to store your changes. 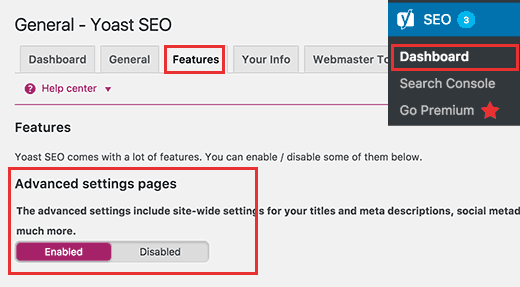 Yoast SEO settings page will now reload and you will be able to see a lot more options under the SEO menu. Headover to SEO » Titles & Meta page and then click on the ‘Other’ tab. Now you need to click on ‘Enabled’ under ‘Use meta keywords tag?’ option and then click on the save changes button. 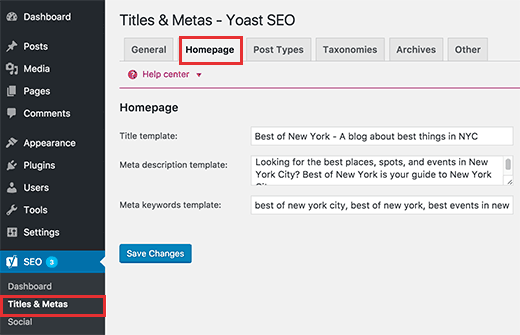 You have successfully enabled meta keywords support in Yoast SEO plugin for WordPress. 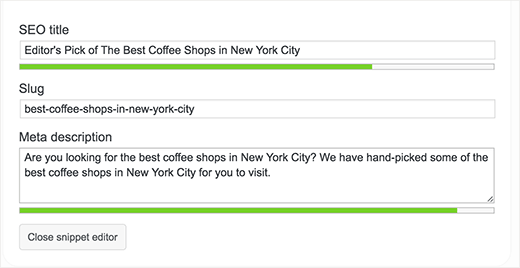 You can now add meta keywords to your posts and pages. First you need to edit a post or page where you want to add keywords and meta description. Scroll down a little to ‘Yoast SEO’ meta box below the post editor. 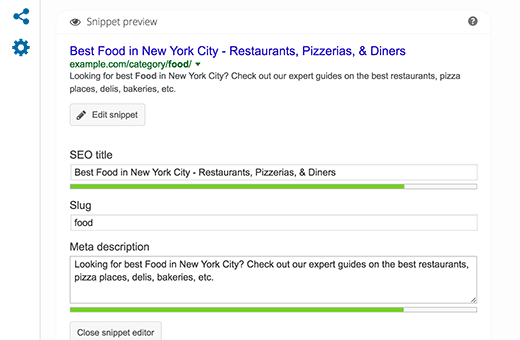 You will see your site’s title and automatically generated description as a snippet. Below that you will see Meta Keywords field. Make sure that you only use keywords that are relevant to your content and that you have already used those keywords or phrases inside your article. Now you need to click on the ‘Edit Snippet’ button and enter your site’s description. This will turn the snippet preview into an editable area. Make sure that you use your main keyword at least once in your description. After that click on the ‘Close snippet editor’ button when you are done. You will be able to see your custom description in the snippet preview now. Congratulations, you have successfully added meta keywords and description to your WordPress post. You can now save or publish your post or page. You can also add keywords and description for your site’s homepage in WordPress. Here is how to do that using Yoast SEO plugin. Headover to SEO » Titles & Metas page and then click on the ‘Homepage’ tab. Here you can add a custom title, description, and meta keywords for your site’s homepage. You can also add keywords and description to your category and tag archive pages. First you need to visit Posts » Categories page. Take your mouse over to the category you want to edit and then click on the ‘Edit’ link. 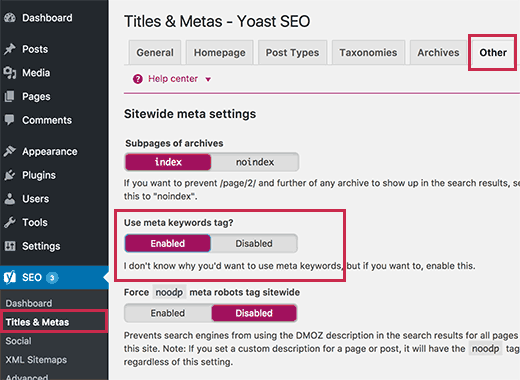 This will open the category editor page where you need to scroll down to Yoast SEO meta box. Now you need to click on the Edit Snippet button to enter your own description of the category. After that you need to click on the ‘Settings’ button to enter meta keywords to be used for that particular category’s archive pages. Don’t forget to click on the ‘Update’ button store your settings. 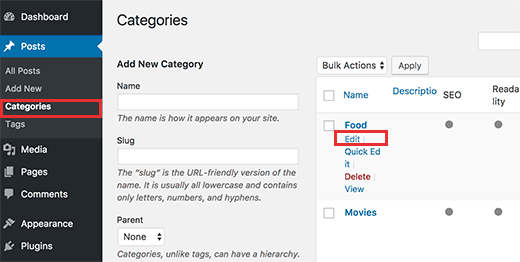 You can repeat the process to add keywords and descriptions to your tags and other custom taxonomy archives. 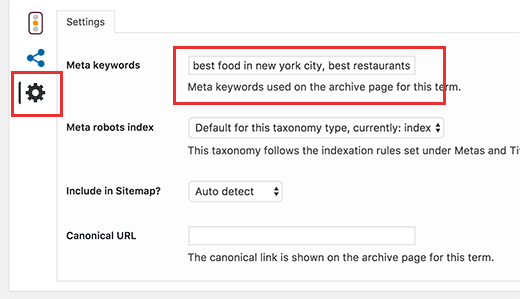 That’s all, we hope this article helped you learn how to easily add keywords and meta description to your WordPress posts and pages. We recommend that you add custom meta description and keywords to every blog post and page that you create.